Southern Illinois University Edwardsville’s Taking Action and Caring for the Community summer camp isn’t just teaching children what to think, it’s teaching them how to think for themselves and make the world a better place by tackling real-world problems through hands-on activities. Students from grades 3-8 are participating in the new camp, running June 26-30. It is offered by the SIUE School of Education, Health and Human Behavior (SEHHB), and the Office of Educational Outreach. Campers are utilizing technology, creating crafts and exploring the outdoors as they learn about such topics as food waste and water quality. 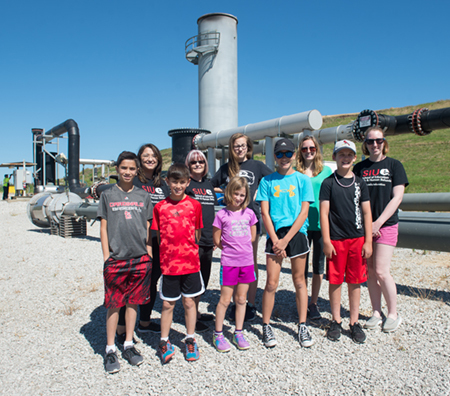 On Monday, campers visited a local landfill where they learned about trash layering processes and wildlife preservation. Throughout the week, they’ll visit SIUE’s Campus Kitchen to gain knowledge on food waste and food shortage, and explore the Watershed Nature Center where they will learn how to preserve natural water lands in urban communities. Additionally, a representative from a local animal shelter will visit the campers and educate them on its catch and release program. The camp also aligns with the state of Illinois’ civic initiative, which is introducing new social science standards in schools. Photo: Taking Action and Caring for the Community camp leaders and participants visited a local landfill on Monday, July 26. 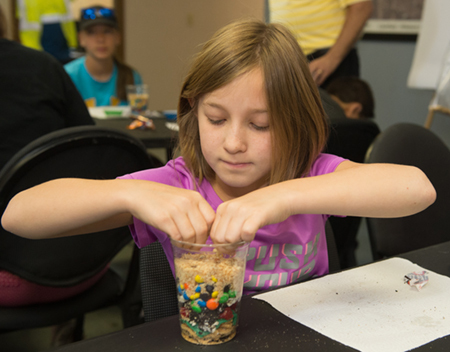 Campers happily engaged in a hands-on activity that taught them about the layering processes at landfills.